One of the fundamental decisions in the design of data centers, server rooms and network closets is which uninterruptible power supply (UPS) systems to use. You cannot be certain that the power you receive from your local utility will be suitable for your equipment, or that it will always be available. And even when you are receiving good-quality power from the utility, equipment inside your facility (such as electric motors) can introduce power problems. A network/server UPS system conditions input power 24x7 to ensure that your equipment always receives reliable power and protection from damaging and disruptive power problems. A network/server UPS system also supports your equipment during power failures, providing enough battery backup runtime to outlast shorter outages. During longer outages, the UPS system will provide enough runtime to save files and gracefully shut down systems or to ensure that equipment is powered until standby generators are ready to support the load. Choosing the right UPS system improves system availability, saves your organization from the high cost and inconvenience of downtime, and delivers significant savings through improved energy efficiency. How can you determine which UPS is appropriate for your application? 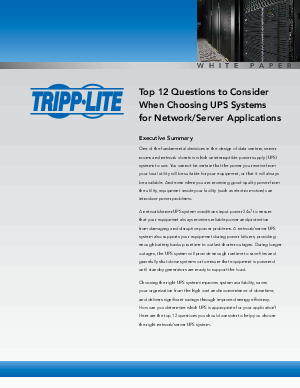 Here are the top 12 questions you should consider to help you choose the right network/server UPS system.